Reuters-TIMA provide live stand-up positions at Euro 2016 in Paris. 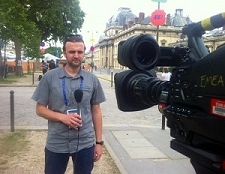 live positions near the Eiffel Tower fan zone and the Stade-de-France to serve clients a month-long football feast. The main football event in Europe is being closely monitored by hundreds of media organisations not only for what happens on the pitch but also due to the heightened security situation in the country. For the opening day on the 10th of June, Reuters-TIMA had a live position at the entrance of the Paris fan zone from the early hours of morning until the crowds left the area at night. The service also provided Reuters clients with a live feed from inside the fan zone, showing the atmosphere of the crowd gathered for the opening game – France vs Romania. 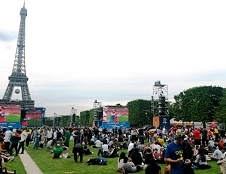 However, for clients who preferred to have the venue of the game as background, a second live position provided a perfect Stade-de-France backdrop. For the rest of the tournament, Reuters-TIMA Location Services will be operational in Lyon and Marseille for the semi-finals, and back in Paris for the big final of Euro 2016.